I have a crockpot and a stove top pressure cooker, but my mother-in-law got me a new One Pot combined pressure cooker/crockpot electric with sautéing functionality too. At first I couldn’t figure out how it would fit into my kitchen tools, but after figuring out that I could brown the meat in the same pot as I slow or fast cook the meal, it became more clear in my mind. I stumbled across this barbacoa beef recipe online and decided I would use it. I got a bit of a late start this morning so used the One Pot. The chuck roast I had was only 3.5 lbs so I had to modify the recipe and would actually modify it a bit further so I’ve included my notes below. I was too busy cooking and eating to take pictures on this one. I liked this as an alternative to Ropa Vieja and Green Chili Pork. It had the flavors of chipotle and acid. My younger daughter didn’t like this, but she doesn’t like anything with Chili powder or chipotle. I’m still waiting for the opinion of my husband and older daughter so the verdict is still out as to whether I’ll make it again. Our garden is a sad state of affairs this year, but my husband still managed to get his garlic in the ground on time. This means that it is that time where I need to figure out what to do with the garlic scapes. Garlic scapes are the flowering part of the garlic plant, that if left on will sap all the strength from the plant and prevent your garlic bulbs from getting plump. In prior years, I have only thrown the scapes into pesto. 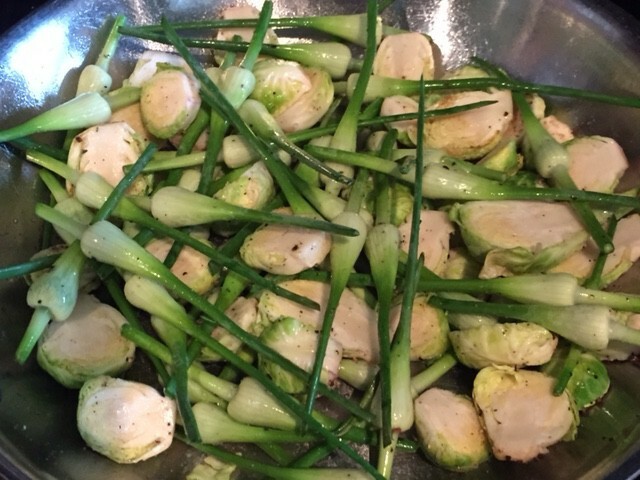 But yesterday I decided that my fresh brussel sprouts from the farmer’s market and the garlic scapes would make a nice side dish. I didn’t have a particular inspiration although I think I have seen them being used on Chopped. My husband really liked this. 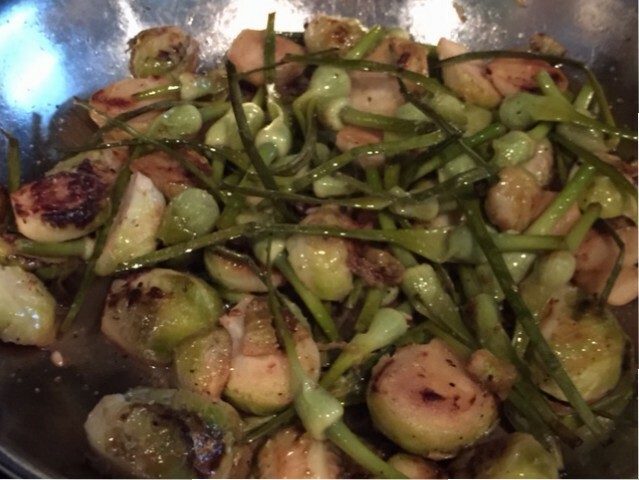 My kids are a bit more finicky about brussel sprouts. 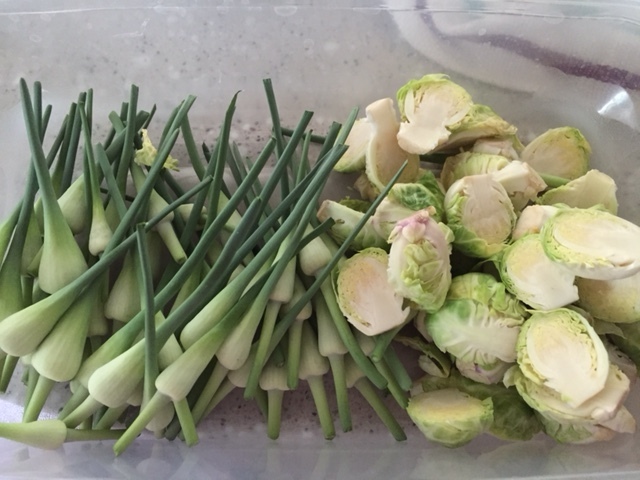 My older daughter doesn’t really like them, but she did try a bit and say “it’s not bad.” The younger daughter loves brussel sprouts but only steamed. I showed the picture to a friend and they said I should add some shrimp next time. Sadly, there weren’t any leftovers. This was very disappointing to my husband when I was making today’s frittata with all the leftover goodies. I like black beans. I like pasta very much. I wanted to combine them together to make a delicious meal for my family. It turned being my family’s favorite meal. I even thought I had some delicious food and a nice meal to cook. We did a bit of a pick your own assembly. 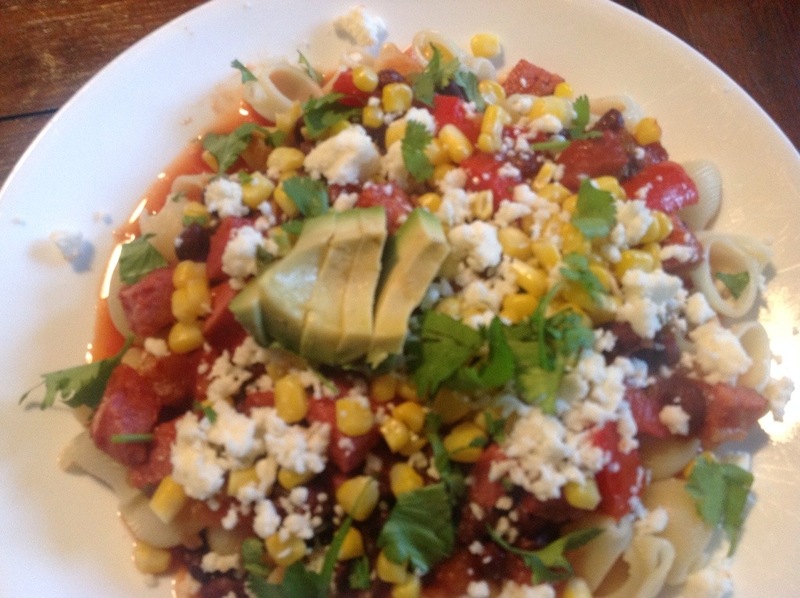 Ana served her pasta and sauce separately, while I added cheese, cilantro, avocado and corn to top it off. This was a win from a dinner perspective. 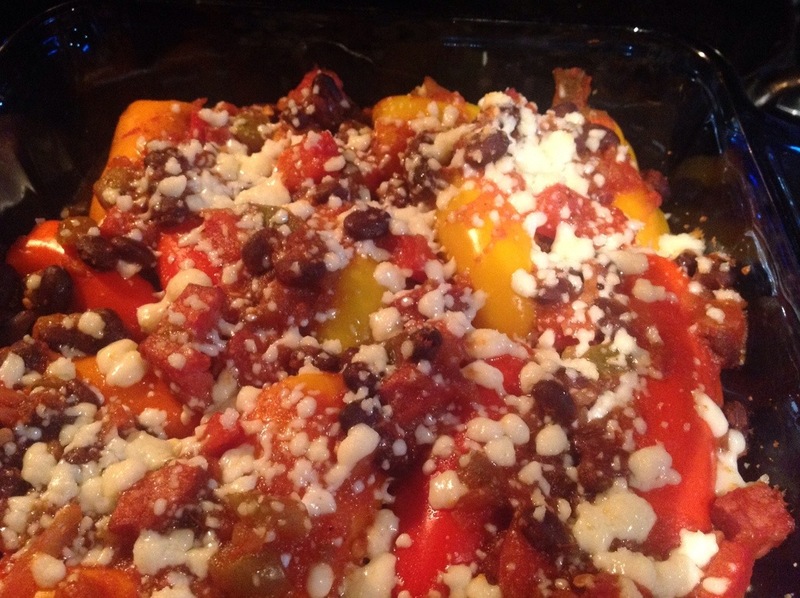 There were even secondary uses applied – you can use it to stuff mini sweet pepper and bake with some more cheese. Cait liked that version even better. 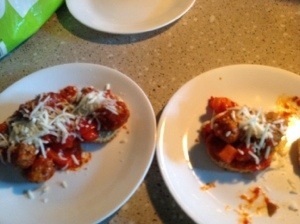 This week Ana asked to make chicken parmesan. I took the easy way out and suggested we use already breaded chicken cutlets. I figured it would be easier for Ana to manage with those, given the risk of hot oil and multiple pans. Although I did give her the option in the grocery store to get chicken breasts and carefully slice them in half. She opted not to do it. We served it with a nice salad and good bread. Ana did a really good job. Everybody really enjoyed it and said she could make it again. Ana was incredibly proud of herself (as she should be) and gave herself a round of applause. She wouldn’t let me post that picture. Hi Everyone! It’s been a while since I posted anything yummy I have been cooking. It’s not because I haven’t been cooking, but rather I’ve been using the rest of my time for other things. That said I’m back at least for the summer. My daughter Ana has decided she wants to learn to cook and has chosen to cook every Thursday night. She can think up whatever she wants (within reason) and I will help find or define a recipe and guide her along. Also, I’ll be the sous chef and picture taker, but she’ll do the work and do most of the write-up. I hope you like my guest blogger. I wanted to make lasagna biscuits because I wanted to try something new. Another reason I wanted to make lasagna biscuits is because I thought it was a meal my family would enjoy. Ana made awesome biscuits. They were probably some of the best biscuits we’ve had in a while. The sausages & peppers turned out fine as well. I wouldn’t say this was the best combination of food together. However, this is Ana’s cooking day. I will not squash her creativity, but let her create her meal and we’ll decide if it’s a “do again” meal. My husband has been on a paleo diet for a little over a month now. I’ve been trying to introduce variety into our dinner options. That said, we have periodically been getting into lulls with chicken or pork. A couple of nights ago I decided that we were going to have something with ground beef. Preferably not chili, or hamburgers or tacos. So I turned to my handy browser and sought out alternatives. 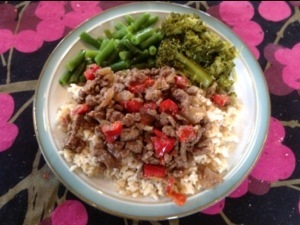 I found this recipe for “simple and quick” Korean Beef. It looked easy enough and I had most of the ingredients on hand. This was tasty. My husband voluntarily ate the leftovers multiple times. I think it was a good way to use ground meat for something a little more creative than chili or tacos. I like the Food Network. I often get inspired by what those chefs are cooking, and continue to be amazed by how bad some people are at cooking. 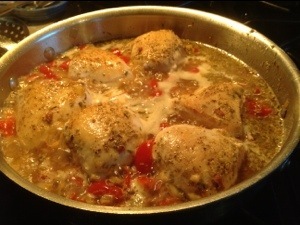 This season’s “Worst Cooks in America” introduced me to Chicken Scarpiello. I mostly followed the recipe on this and it was really good. It definitely hit the make again list, and the flavor to spice was perfectly balanced. 7. Add wine to deglaze pan. Reduce by half. 10. Put in preheated 300 degree oven for 40 minutes (You could simmer on stove for 15 mins per pound or put in oven for 15 mins per pound at 350 degrees. This allowed me to run out on an errand while it was cooking). Look how rich and delicious that sauce looks! I saved that too. I had the opportunity to taste kale guacamole last week and really enjoyed it. The texture is a little different than I normally make my guacamole but it kept the dip green and added some extra vegetables. 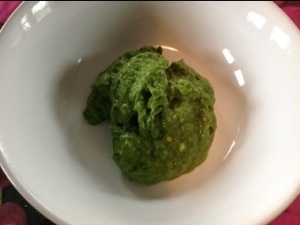 I first found this recipe for plumped up kale guacamole and it was ok. I ended up using for citrus, another avocado and wished for onion and jalapeño heat (next time). My friend who made the version I tried used this super bowl recipe as her base. The initial taste is pretty veggie like, but once you get over that and let all the flavors blend it is really good. It needed some spice that wasn’t in the originally recipes. We’ve been using it for dip, and serving it with everything from frittatas to stuffed peppers. 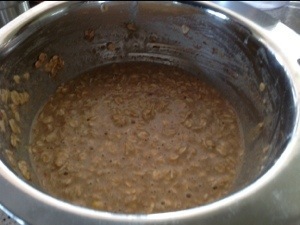 I don’t like oatmeal for breakfast. I don’t know if it is a carryover from growing up in a hot place or if it’s a texture thing – i don’t really like grits or polenta either. Anyway, I do like oatmeal in crumbles, or cookies. 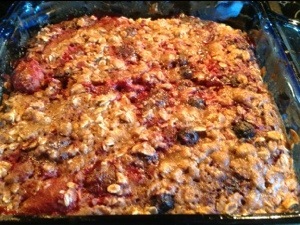 I was intrigued by this recipe to for strawberry-rhubarb baked oatmeal. It sounded like a good breakfast alternative with lots of fruit. 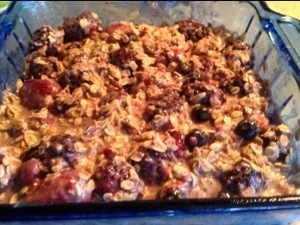 I did make about half the recipe and used previously purchased frozen mixed berries. I gussied it up with a dash of cinnamon and vanilla extract as well. The flavor was good but mine took a about 20 minutes longer to cook. 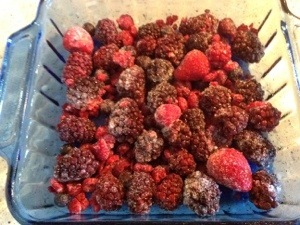 I think it was partially due to the larger size strawberries and blackberries. This recipe is forgiving as well. I made a mistake when adjusting the recipe and added the original amount of applesauce, but then reduced the vegetable oil. Also, I had leftover cinnamon sugar and used that instead of the brown sugar for sprinkling. 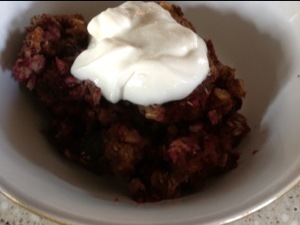 I served my serving with a dollop of greek yogurt. 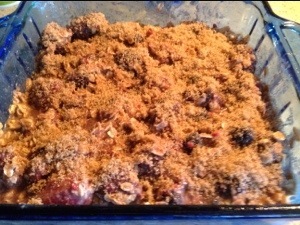 The tanginess balanced out the sweetness of the fruit. I liked it and would definitely make it again as a breakfast alternative. Why is it that people are a little afraid of making homemade soup? It doesn’t make much sense to me. 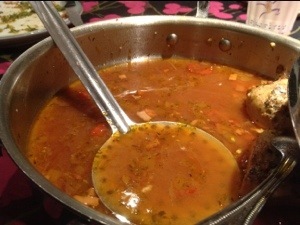 Homemade soup is extremely nutritious and you can customize it to your liking without any real effort. It is also a really good vessel for using leftovers, things from the freezer or fresh ingredients. You can make it over a couple of days, overnight in a crockpot, in a couple of hours or really quick if you have ready ingredients on hand. Chicken soup is the most common for me, but that’s because I tend to cook chicken regularly and keep the pan drippings and chicken carcasses. I tend to add the pan drippings to a container with other pan drippings. One thing to note here though it that you really need to be careful about how much pan drippings you add to your soup stock. It is very easy to go from perfectly flavored to almost too rich. For today’s soup I used two small chicken carcasses. The first thing I did was pull as much meat off the bones as I could. This allows you to use that meat for the soup later, plus any additional meat that you were not able to liberate until after the stock making process. I added a quartered onion (skin and all), 3 carrots, 3 celery hearts (leaves and all), a couple of slices of ginger, the rest of an open bottle of white wine and covered it all with water. I let it simmer for 3-4 hours and put it in the fridge overnight. 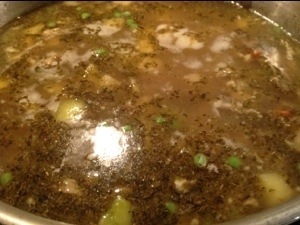 I strained the stock into another pot, and picked off any additional chicken. I then let the stock reduce for about an hour and tasted it for flavor (at this point, I have added no additional seasoning). My tastings led me to add about a cup of pan drippings and let that simmer as well. Now it’s ready for all the goodies we want – we’re doing chicken, carrots, celery, kidney beans, peas and corn, maybe some cous cous. I’ll let you know in the directions below. 3. Plan what else you are adding. We are adding kidney beans, frozen peas and corn, frozen turnips, and some cous cous. There is a little orchestration going on here as you need to make sure everything gets the proper cooking time, without overcooking anything. For me, this was adding the carrots and celery and simmer for 20 mins, add beans and cous cous (3 scoops – about 1/2 cup) simmer for 2 more mins, add peas and corn and chicken. 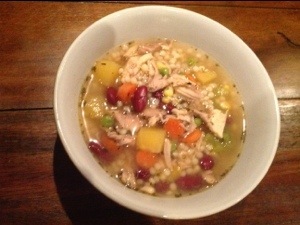 My daughters gave me Chopped style running commentary on my soup. It even won Chopped! That’s so exciting. But it definitely made us warm on this cold winter day.